Have you heard of Amy Thielen and her book, The New Midwestern Table? I enjoyed watching the first season of her show, Heartland Table, on the Food Network. I haven’t made any of the recipes she made on the show, but when I saw this meatball recipe, it went on my short list of new recipes to try. They aren’t going to win a beauty contest, but you won’t care about that when you start popping them into your mouth. The peanuts, scallions, and carrots add a nice texture to the meatballs, and the tangy Asian flavors in the sauce keep you coming back for more. With only two of us in the house, we were eating meatballs for days, but we didn’t get tired of them, and I plan to make them again soon. I made a few changes based on my preferences. My version was delicious, and I have no doubt that the original version is also fantastic. Note: Make sure that the crushed/chopped/minced items are very small; the meatballs are small, so you want to avoid large pieces of ingredients. Mix in a large bowl with your hands: pork, turkey, peanuts, panko, egg, parsley, carrots, scallions, 1 Tablespoon soy sauce, 1 teaspoon salt, 1/2 teaspoon pepper. 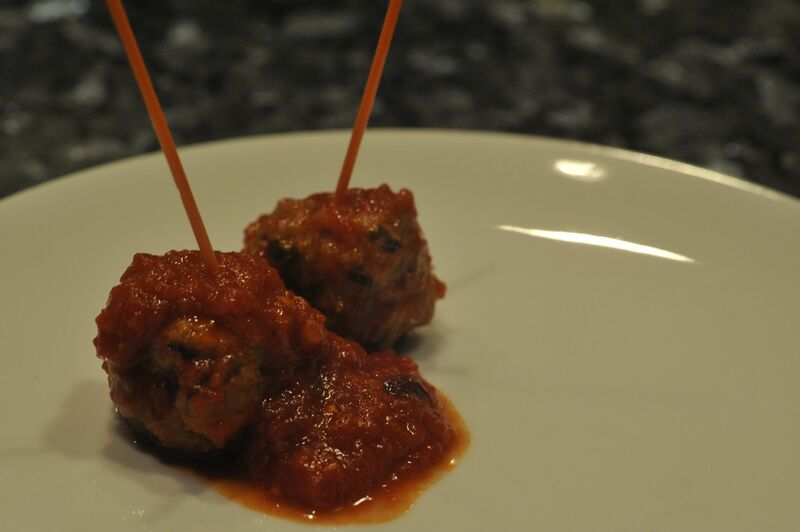 Roll into Tablespoon-sized meatballs and arrange on baking sheets, leaving a little space between the meatballs. You should get about 45-50 meatballs. Bake about 15 minutes, until the meatballs are firm and cooked through. While the meatballs are cooking, pour the tomatoes with their juice into a food processor and process until smooth. In a large skillet or dutch oven, heat the oil over medium-high heat. Add the ginger and cook until fragrant, about 2 minutes. Add the pureed tomatoes, 3/4 cup water, the brown sugar, chili-garlic sauce, the remaining 2 Tbsp. of soy sauce and the fish sauce. Simmer, stirring often, and scraping the sides, until the sauce has reduced by about half, 5 to 10 minutes. Turn off the heat, add the lime juice and season with salt. Add the meatballs to the sauce and cook, stirring often, over medium-high heat until the meatballs are glazed with the sauce, 10 to 15 minutes. (At this point you can keep the meatballs warm in a crock pot.) Serve with toothpicks.